Rising Voices note: This post is part of the feature commemorating RV's 5th Anniversary. In 2008 Kenyan blogger Serina Kalande led a working group to discuss how citizen media can best be used to encourage and expand the dialogue on HIV/AIDS. The discussion triggered a series of online chats to pinpoint concrete steps that could be taken to support those working in this area and give them a greater voice. The result? The following year the “Blogging Positively” e-guide was launched, providing tips on the best ways for HIV/AIDS activists, whether they’re facilitators or teachers, to use citizen media in their work. The guide also contains a collection of case studies and interviews, spotlights some of the leaders and veterans of the HIV-positive blogging community and has valuable resources for new bloggers just getting started. The title of the guide was coined by Kenyan blogger Daudi Were and it was authored by Janet Feldman of the HIV/AIDS organizations KAIPPG and ActAlive. 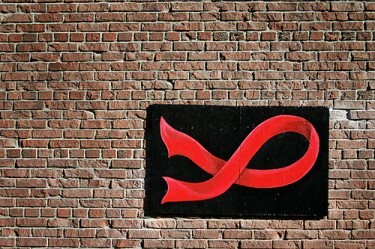 Image of HIV red ribbon by Flickr user Bitpicture under CC BY-NC-ND 2.0. The guide is now available in five languages, including Spanish, French, Swahili and Russian, with Arabic on the way. It can be downloaded and used freely by organizations and individuals working in the field of HIV/AIDS education, prevention and treatment. The guide is licensed under a Creative Commons Attribution-NonCommercial-ShareAlike 3.0 Unported License. To complement the guide and help put a personal face on the pandemic, a map-based directory was created in 2008 of HIV-positive bloggers and groups who blog about the disease. More and more such bloggers have been joining the blogosphere, as showcased in the map. Many of these bloggers have bravely defied stigma and discrimination to communicate their situation and express their opinions to the rest of the world. The Blogging Positively working group continues its efforts to encourage the use of citizen media to spark and sustain these conversations about HIV/AIDS and its impact on communities. Activities include regular blog posts on related topics, including highlighting the work of Rising Voices grantees such as Repacted in Kenya and HIV/AIDS activist Leah Okeyo, and the development of a Blogging Positively teaching curriculum for use in workshops and classrooms. Individuals and organizations who are interested in this work can join the Blogging Positively discussion group by subscribing here. Contact the working group by emailing us at: eddie [at] globalvoicesonline [dot] org. HIV effected people are also living beings don’t behave rude with then. They also have right to live like a common people. It’s great how Serina is helping people afflicted with AIDs use social media as a vehicle for getting their voices heard. So often it seems like activism is by and large about victims, but not by victims. This should help promote a greater understanding of the issues those diagnosed with HIV by those not suffering from it. Thanks for spreading awareness of this guide, RV. Word needs to get out!